I know that there are some of us who find it hard to break free to the life that God has called us to. I do know this for a fact in my own life, when I am stuck, when my life seems to be spinning out of control, I can retrace it to something from my past. I find it interesting that Paul in the above verse, tells us right up from that he does not consider that he has made it his own. He has not arrived, the goal has not been achieved, he is not where he will ultimately end up. This encourages me, because when I read Paul’s work and I look at the testimony that Dr Luke gives us concerning Paul, I come away thinking he was a great man of God (which he was), and that he was near perfect (which he wasn’t). I am grateful because I am a man of God (only God can really say we are great), and I am definitely not perfect. So, you may be asking why are you encouraged by what he said? I am encouraged because he stated that he hasn’t arrived but he does one thing that is of importance. What is that one thing? 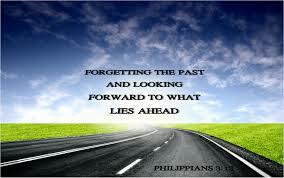 Forgetting the past and straining forward to what lies ahead. Forgetting the past is a daily thing you know. I know that in my experience as a believer, everything I get stuck in my walk with the LORD, or if I find myself worried or anxious about something, it has a connection to my past especially if the past had a negative outcome. So, what Paul tells us is, that we need to forget that which is behind, put it in the rearview mirror and don’t look back into the mirror. Leave whatever it is back there. The problem with many of us when we come to the things of the past is, we want to forget the horrible things, but we have to forget those things that might have worked for us in the past, but are really things of our flesh. If you read early in chapter 3, Paul gives us his resume (and it is pretty good), but it was filled with things done in his flesh. Now, did God use some of those things in Paul’s ministry, yes, yes, and again yes, but they were Spirit driven then and not driven by his own flesh. Hear me brothers (and sisters) who are reading this blog. Not that I have arrived, Lord knows (and so does everyone who knows me) but one thing that I do, I forget that which is in the past (the good and not so good), and I press on or strain ahead for that which is in my grasped to handle today. Why? Because there is a prize that is awaiting for me in Christ Jesus, in heaven itself. Know what that prize is, Jesus himself. I can’t wait to get home to claim that prize, but until then, I have a past that has been redeemed, a present that is full of power and promise, and a future hope that is as safe as the One who has promised it.